Maybe I had spent a bit too much time with the Super Bike during the 2015 Trans Am Bike Race. How else to explain why the bicycle remained forlorn inside its cardboard shipping box for a whole seven weeks after the race, and that I did not even ride it again until a couple days before today’s 200 kilometer brevet put on by the Rocky Mountain Cycling Club. Those two days gave me just enough time to replace both of the shifter cables and housings with new ones, convert its lightweight wheelset to tubeless, and give the bicycle a thorough washing and tune-up. By the time it was all said and done (many hours), it was dialed. When I got to the start of the ride—a Conoco gas station in Mead, Colorado—there were already nearly 20 other riders there ready to roll. John Lee Ellis remarked how this was a rather good turnout for a September brevet, a few days before the official beginning of fall. Turns out at least half of the group were speed demons. 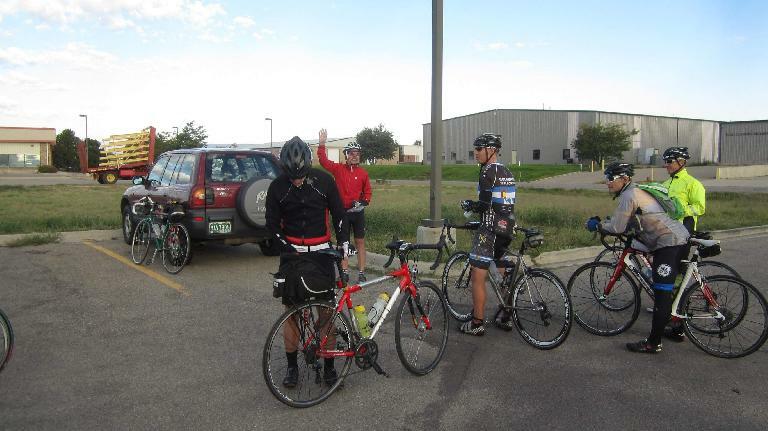 This included Lloyd, whom I last encountered in the 2011 St. Vrain 600km Brevet. He said he had been riding quite a bit this year, getting into the “racing madness.” He joined the lead group, which I did not care to draft off of but tried to keep in sight while riding efficiently and conserving some energy. 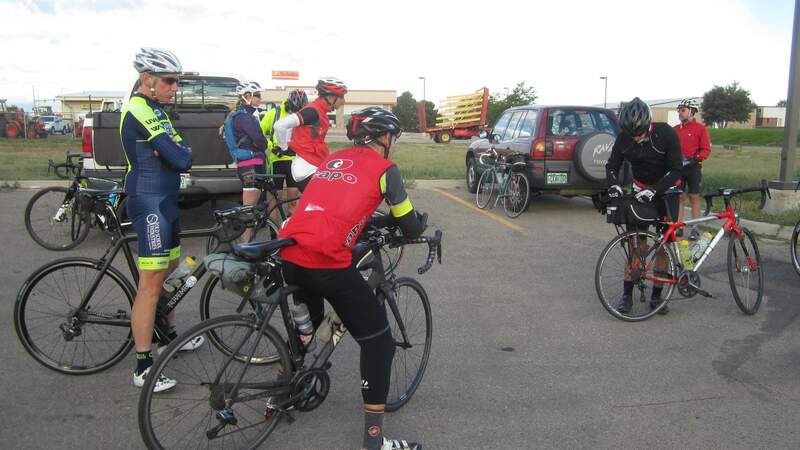 I managed to do so up until about Longmont, when traffic lights were not very favorable to me. That was Mile 12 and by that point my overall average speed was just a few tenths under 21 miles per hour. Perhaps too fast. Make that definitely too fast. By the time I reached Masonville (Mile 40) my legs were starting to talk, something about being sore. 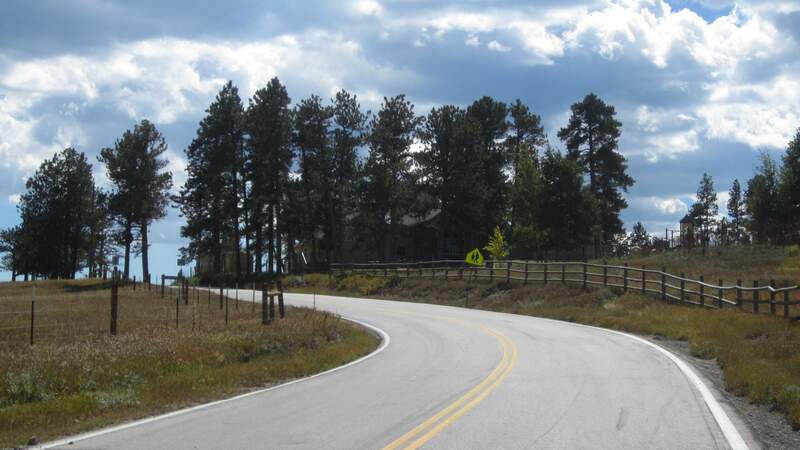 Then when I got to Centennial Road on the east side of the Horsetooth Reservoir—in my hometown of Fort Collins—they started cramping up the steep climb to Duncan’s Ridge. The inner thigh muscles—which I’d later learn are called the adductors—were screaming with every revolution up that hill and when I crested over the top I was actually amazed I was able to continue spinning the pedals through the pain. There were a few more punchy climbs by the Horsetooth Reservoir, all that I was very familiar with due to training here a lot. I made it to the Mile 48 checkpoint—Vern’s Place, a convenience store and restaurant in Laporte—without further incident. My overall average speed was still 17.8 MPH by this point, which I considered very decent considering the distance and hills. 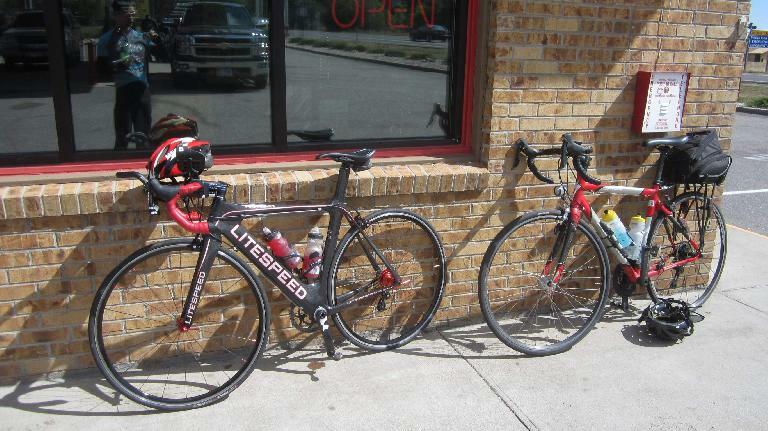 At Vern’s I met another brevet rider named Mike, who had ridden Paris-Brest-Paris last year. He said he had been riding with the RMCC for a couple years and that it was kind of a different randonneuring club because its members actually try to “race” the brevets. Knowing that my legs had already been cramping and that I would have to ride a little slower, I took off from Vern’s a little before Mike. 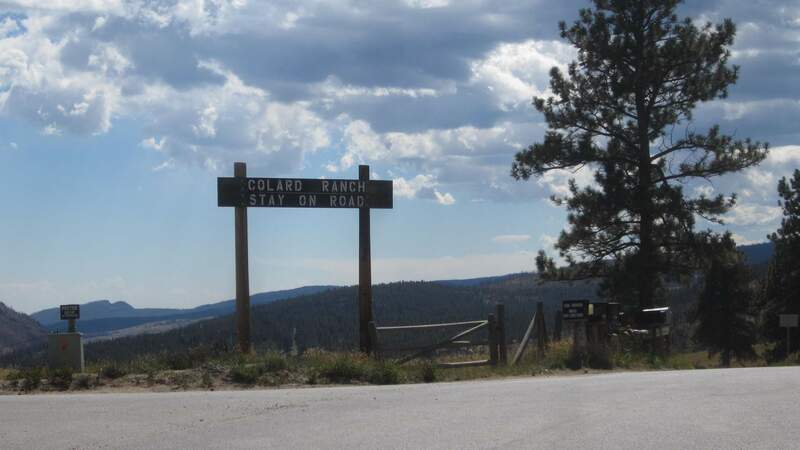 Especially considering there was a long climb ahead up the Poudre Canyon and to the top of Stove Prairie. How long was the ascent? Nearly 22 miles. The adductors continued to give me issues up by the Poudre River, but the canyon climb was gradual enough that they were only on the verge of completely seizing up during one or two short steeper sections, such as the one to Gateway Mountain Park. No, seizing—or rather, ceasing—would only occur after I had turned onto and ridden a couple miles up Stove Prairie Rd., about 19 miles after I started the long Poudre/Stove Prairie uphill. I had to unclip, stop, and pull underneath a tree for a few minutes. The adductor muscles would not disengage and while grimacing through the pain I tried to massaging them using my thumbs. There were huge, hard knots in them. The thumb method was ineffective but I finally got the muscles to relax a little by keeping both legs slightly bent and rolling them out using a water bottle. A couple minutes into this Mike caught me and slapped me a low-five while I was on the ground. He had told me at Vern’s that he cramped up this climb during last year’s Stove Prairie 200km Brevet, so I knew he could totally empathize. He offered me some pickle juice for the cramping but I declined, not wanting to use up his supplies. “Keep on riding, young man,” he encouraged as he rode past. I got back on my bike a couple minutes later. 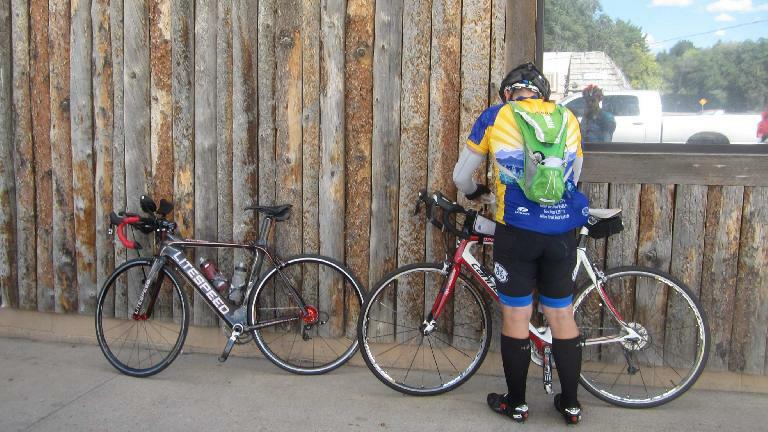 This was the first time I had to stop on a climb due to cramps during a bike ride in at least a decade—maybe two—but it was what it was. When I saw a yellow school crossing sign I actually breathed a sigh of relief as I knew that was the top (Mile 72) and I could start descending, finally. The rest of the ride was anti-climatic. Never mind there were still 50 miles to pedal and there were still a few more punchers—I managed to stay in an efficient, aerodynamic position while using the drops or the aerobars 95% of the time. My legs continued being close to the point of cramping during much of this but somehow I kept on pedaling at a fairly optimal cadence and resorted minimally to coasting. As the final 15 miles ticked down I got motivation from the realization that I could finish under eight hours, making it one of my faster 200km brevets. In fact I did so with four minutes to spare and my phone registered a 16.2 MPH moving average (Strava data would later say 16.1 MPH). Not bad for a ride that was longer than a century and the hills gave me more problems than expected. Plus I still had the whole rest of the evening to do other stuff. This may be the last long ride on the Super Bike for this month, as I’ll probably switch back to the Cannondale for general training. But it won’t be another year until I ride it on another brevet, no doubt.